Home-study used by the owner in some periods of the year, situated between the historic districts of Testaccio and Trastevere, a few steps from the Sunday market Portaportese. The apartment is located in a typical 30s recently restored, the access is on the first floor without elevator (30 steps) and is particularly suited to those who appreciate charming apartments with a personal touch. 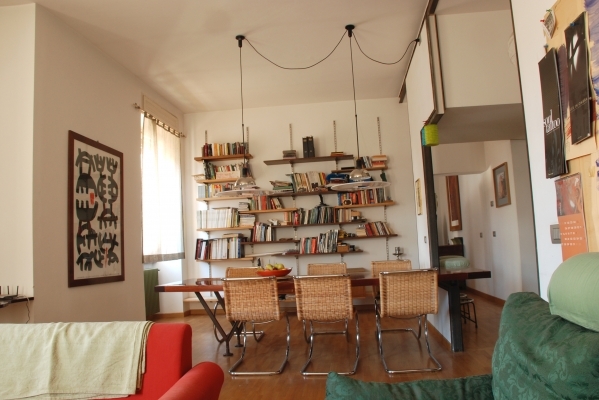 The apartment is well served by public transport providing easy arrival from the airport and train station (the station of Trastevere is within walking distance). It is connected with a few stops (line 8) to Largo Argentina and Piazza Venezia with the archaeological area and the whole area and historical monuments of the city and on Sundays you can visit the market Portaportese with the entrance just steps away. Most of the historical sites of the city can be reached with a few stops on line 8 that runs through Viale Trastevere until Tiberina Island and then to Piazza Venezia. The accommodation consists of two rooms , kitchen, bathroom and a small terrace overlooking a courtyard with gardens and trees . The first room is a large single room is very bright with three windows, the entrance area of ​​the apartment with closet, shoe rack and a coat hanger , a living area with 3 sofas ( with sofa bed ), a large table with 6 chairs and bookcase wall , the area of access to the kitchen and bathroom and to the second room. The kitchen is equipped with all the cooking facilities with fridge and freezer , gas cooker with 5 ring hob and cooker hood , an electric grill on the work surface and a microwave. There are also supplied with pots, pans, an electric steamer , electric kettle as well as crockery and some basic ingredients (sugar, olive oil, salt). The bathroom has a niche at the entrance with a washing machine is equipped with a washbasin with a mirror on the wall, toilet and bidet and a large concrete pool that doubles as a shower. In addition to the heated towel rail on the wall in each room there is also an electric fan and a hairdryer . The bedroom has a double bed (160x200) and is furnished with 2 wardrobes, 2 chest of drawers , mirror, chest and nightstand , lights and ceiling fans. Light, stylish apartment. Easy bus or tram ride from centre of Rome. The flat is absolutely beautiful and has everything you could need. The owner had cooking utensils and also essentials like oil vinegar and coffee there anf he was very helpful. It had great transport links and although not a short walk to the city centre it id such an easy tram ride. The flat is also so lovely you may not leave! Very comfortable apartment, good location in Rome! Molto confortevole, luminoso, arredamento originale, funzionale e molto spazioso. Centrale a Roma e ben servito dai mezzi pubblici, ottimo anche per brevi soggiorni di lavoro/studio o relax!! L'appartamento è carinissimo, ha un tocco di originalità; pur essendo molto funzionale. è molto luminoso e spazioso e la fermata del # 8, il tram che porta in centro a Roma è raggiungibile a piedi in pochi minuti. Le fermate sono 3 o 4 al massimo per arrivare a Largo Argentina e da muoversi a piedi per il centro romano.